“Persea Americana” is avocado! This is a 2013 research paper that says avocado pit kills intestinal parasites and tuberculosis bacteria. I was trapped in hospitals and nursing homes for a year and a half. I love to find little treasures of information like this, because —though management deprived me of my herbal remedies— NEXT TIME, I will know how to take care of myself with something as simple as an avocado pit. Persea americana seeds are widely used in traditional Mexican medicine to treat rheumatism, asthma, infectious processes as well as diarrhea and dysentery caused by intestinal parasites. Tinctures of avocado seed are for sale online. They are quite expensive, $20 for 2 ounces. $55 for 8 ounces. But you can make your own tincture for just the price of the 100 proof Vodka, Tequila, or Everclear Alcohol. This lovely MountainRose video shows how to make a tincture. They last for years! Okay, so I made a cute little jarful of avocado seed tincture two weeks ago,...later tasted it,...and wasn’t fond of how it tasted. (that’s a sad face, not a smile.) Two days ago, I added the finely peeled skin (colored portion only) of one lemon to the jar of avocado seed (pit) tincture. Today (just now), I used the lemon-flavored avocado seed tincture to spike a tea containing fruit juice,...and it was good. Even the slight bitterness of the avocado seed tincture didn’t taste bad. I thought I’d let you know. Here’s the little jar. 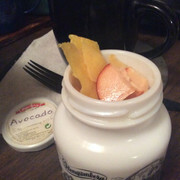 I pulled up some of the slices of avocado seed and lemon peel (rind) out of the alcohol. I wanted to show you how thin the slices are. I see that my above video link on how to make a tincture has stopped working, so here’s another one. Also, I found a nice research article saying that avocado pit (seed) tincture is good against blood clots,...something that is a common problem for SCI folks. So, save that pretty avocado pit, slice it, and put it in a little glass jar with Vodka or Everclear.